I’m a dog person. Always have been, always will be. 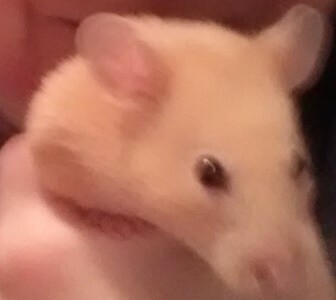 But despite that, three months ago I happened into a pet store and promptly fell head over heels in love with a hamster. Not an ordinary hamster, mind you, but a Princess Hamster—Stella. I’ve learned a great deal from having Stella in my life. 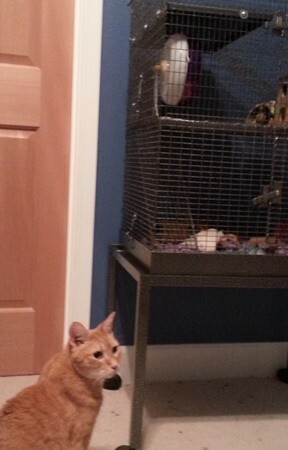 Hamster lesson number one – Cats, no matter what they tell you, really do want to eat your beloved hamster. Hamster lesson number two – When out of their cage and not in a human’s hands, hamsters really do need to be in one of those plastic hamster balls. For her first few weeks, Stella convinced me that being placed in a plastic ball and set on the floor was beneath her. Wanting nothing but the best for my beloved, I started letting her roam free. That put the kibosh on downstairs free roaming forays. But I was still reluctant to put my Stella in something so confining as a hamster ball, so I decided to limit her free range activities to my upstairs writing cave. Unfortunately, Stella is nothing if not persistent and dedicated. To Stella, a closed door is merely something beneath which she needs to burrow. And the carpeting beneath the door simply an obstacle that exist to be destroyed in the process. In an effort to protect Stella’s free range activities, I came up with a brilliant plan to protect the carpet—I placed decoy carpet remnants over the real carpet. It would have worked, too, I suppose, if Stella had been an ordinary animal. But Stella was not so easily fooled. The decoy provided a brief respite from carpet destruction. But only brief. I will say this, if the average American applied half the energy and focus to any pursuit that Stella put into destroying my carpets, we’d be the most productive country on the planet! Sadly, Stella’s primary excursions now take place via hamster ball. I still allow her free range time—but only when I can watch her every move. Hamster lesson number three – I have, until now, completely under appreciated the skill and brilliance of hamster photographers. One day, as I browsed the pet store aisles in hopes of discovering yet another new and exciting hamster “essential” for my Princess, I bought one of those cute, glossy, hamster magazines. Yes, Stella is definitely the cutest hamster ever to have graced the Earth! Naturally, I immediately realized that I lacked a supply of cute Stella photos on my phone to which I could subject friends, acquaintances and unsuspecting passerby. I did, admittedly, have the one on the left, taken of Stella in her castle shortly after her arrival. But it hardly does her justice! Overcome with guilt at this lapse in Stella-worship, I dashed home, eager to fill my phone with as many Stella photos as it could hold. Many weeks, and more attempts than I care to admit, went in to trying to capture my hammy’s undeniable cuteness. Unfortunately, although she knows she is cuteness incarnate, Stella saw no reason to halt her daily activities in order to stand still and pose for her adoring human. I quickly realized I was in over my head and enlisted the help of my husband—who is actually quite impressive with his photographer skills. It dawned on me that capturing hamster cuteness on camera, like the photographers who work for hamster magazines do, takes great skill and brilliance.